Ken after his haematite discovery. The rain has now fully cleared and so another typical Orcadian summer’s day. And what a day it’s turning out to be! In the central chamber of Structure Ten, there have been some fantastic finds that may be associated. Ken discovered a large nodule of haematite (iron ore, from Hoy). This mineral is presumed to be the pigment used in some of the “painted” walls that has been discovered on site this year. The haematite nodule from Structure Ten. Although still displaying part of its natural botryoidal (a globular external form, resembling a bunch of grapes) form, there are also several polished facets on its surface, where it has been smoothed through use. Apart from being crushed into a powder, before being mixed into a paint, hematite can also be rubbed, with a little water, directly on to stone to produce quite vivid colours. Only a matter of metres away, Antonia may have discovered an example of this – a thin broken stone slab, with a faint, but definite, curving streak of red across its surface! In Structure Eight, on his last day on site, Paul made a lovely find, in the form of a polished stone tool. Since the end of it is missing, we can’t decide whether it is the end of a very small axe, or a larger form of the polished stone “spatula” we discovered earlier in the excavation. The trowelling line across the interior of Structure Twelve has almost finished removing the next layer of the thick, “middeny” soils that make up the upper fills of this building. Photographs will now be taken from all angles, and from the photographic tower, as part of the site recording procedure. More of Structure Twelve being revealed. On the outside of Structure Twelve, a small, slit trench has been opened up against its outer wall face in order to give us an insight into its construction and what depths of deposits we will be dealing with. This has revealed what appears to be another wall face, about 0.5 metres outside of the outer revetment of Structure Twelve. Does this represent yet another adjacent structure? Or perhaps this is similar to the wall we have found encircling Structure Ten. Will Structure Twelve also have a paved walkway/passage defined by this wall surrounding it like Structure Ten? The plot thickens – watch this space! Flagged surface outside the “Lesser Wall” just being revealed. Sarah and Luke may have found the bottom of the Lesser Wall! Towards the end of the day, a paved surface started to slowly emerge before the outer face of the wall. If this is primary paving, that perhaps just overlies the basal courses of the wall, it will mean that the wall has survived to approximately 1.6 metres in height! Not quite the height that some had imagined, but very impressive none the less. From the trench front. . .
Hi fellow Orkneyjar bloggers, I’m Alan Burchell, from Totnes, Devon. I have been on site since August 2, although I am reading a part-time degree at the University of Bristol, I am not here as part of the course. I am one of those strange people who enjoy “the dig” and I wanted to gain more experience. I have come to the academic world late in life. I left school at 15, joined the army (Royal Engineers) after 15 years, changed my uniform from green to blue and became a police officer. After 20 years, I retired on a pension and decided to go back to school and now I am a student (you are never too young to learn). I have now completed my first year at university and have enjoyed it immensely. What am I doing in Orkney? 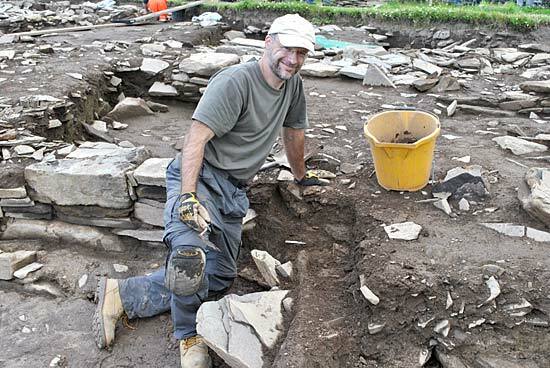 Apart from the archaeology and the chance gain experience and meet new people, it’s a wonderful place to visit. There is a magic here that will steal your heart. I have had the opportunity to work on Structures Eight, Ten and Twelve, with people who are more than willing to help, explain, or just show, how the job is done. What have I found? Lots of bones – cattle bones mostly, with a few pigs teeth, a few fragments of Grooved Ware pottery and a small flint. On my first few days I seemed to be finding a lot of triangle shaped stones, this got me thinking, what if the experts had got it wrong! this whole site was a triangle factory? It seems my theory has not reached the academics and is one to be that will not see the light of day (prove me wrong, I say). That’s enough from me for the day.